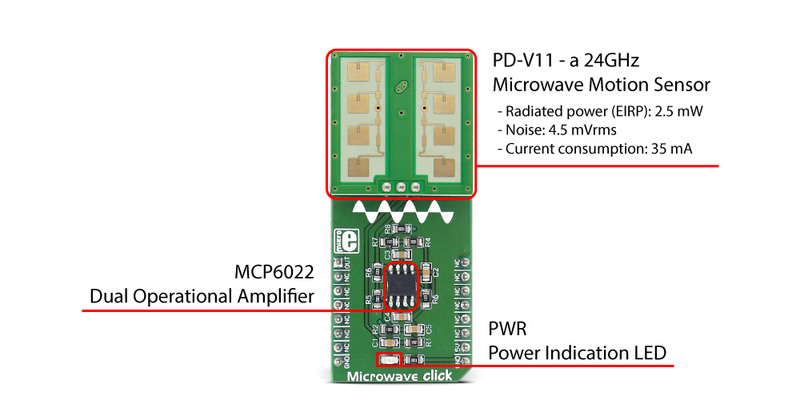 Microwave click detects movement, thanks to the PD-V11 a 24GHz microwave motion sensor. The typical use for Microwave click is a proximity or motion detector in various applications and devices. The Microwave click can detect movement or proximity by using the Doppler effect. 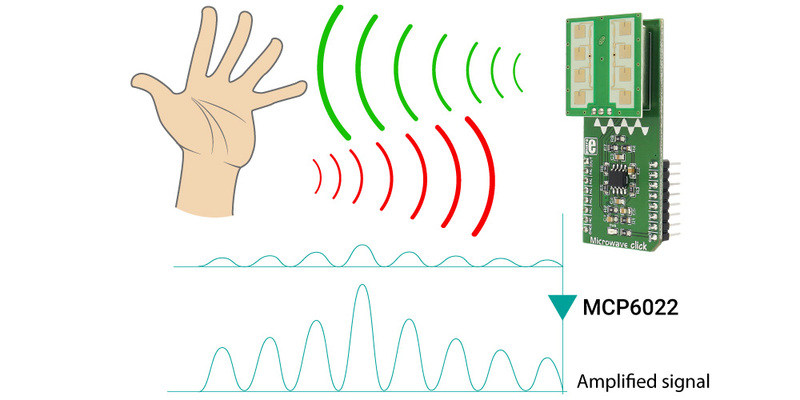 The onboard microwave motions sensor transmits waves and picks them back as they hit an object, with their frequency changed. Microwave click detects movement of objects utilizing Doppler effect. When the PD-V11 microwave sensor is powered on, it starts transmitting radio waves of fixed frequency. As the waves hit a moving object they are reflected back toward PD-V11 microwave motion sensor, with their frequency changed, depending on speed and direction of object's movement. The Doppler effect - a change in frequency of a wave for the observer and object move closer or further apart from one another. A typical example of the Doppler effect is when a vehicle with siren passes and you hear the pitch drop of the siren. The PD-V11 microwave motion sensor low power consumption, low noise, and a low wireless power output. See the datasheet to learn more. The PD-V11 microwave motion sensor picks up reflected waves and converts them to a voltage signal. This signal has the magnitude of several hundred microvolts, so it's sent to the MCP6022 which amplifies the signal, in order to make it readable over the Analog pin on the mikroBUS™. This signal is amplified up to 3.3V. Once amplified, the signal is routed to the Analog pin (OUT) on the mikroBUS™ line. The proximity of the object can be determined by measuring the amplitude of this signal, and speed/direction by determining its frequency. The range at which Microwave click can detect movement depends on the way the algorithm is written (see the Software Support section).